Most of us aim for good health through the nutrient-rich food we eat in moderation and regular exercise. Our diets are comprised of seasonal, whole foods that tend to change with the transition of the climate. Lately Byron and I have been dining on slow-cooked soups from my crock pot but on the occasional warmer morning, I have been boosting my energy the natural way, with raw food smoothies. 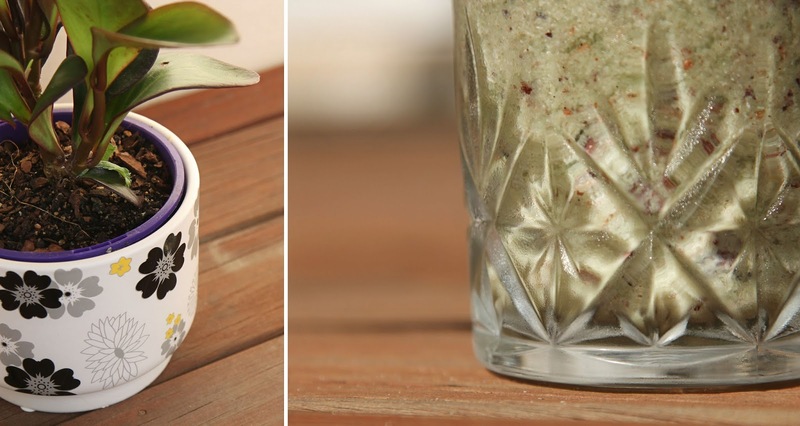 This is a vegan superfood smoothie, inspired by the benefits to be gained from raw-food living. It is filled with organic, raw ingredients and loaded with magnesium from cacao. The naturally stimulating energy from the cacao and rich green spirulina will help you to focus, to create or in my case, to study for university exams. 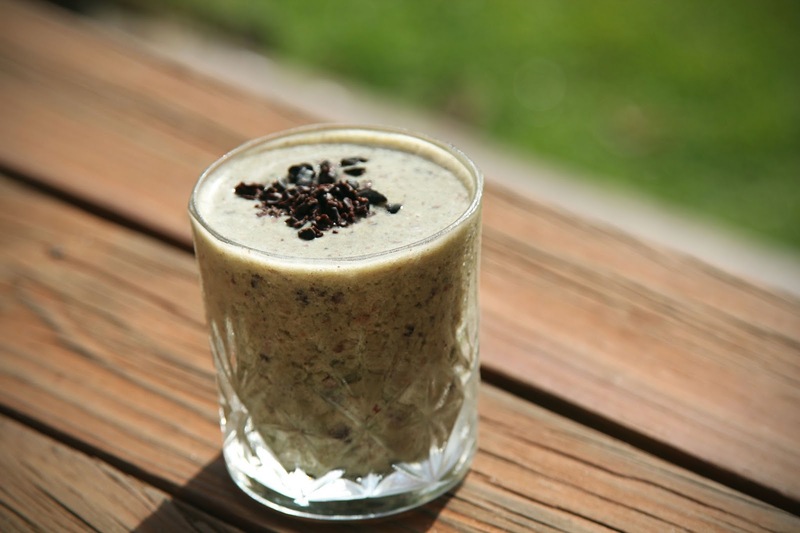 This smoothie beats a black coffee for longer lasting energy and takes less time to prepare. If your morning is golden and warm or perhaps you intend to go for a run along the beach today, then I would wholeheartedly suggest you try this smoothie for it's cool, delicious flavour. Blend all ingredients in a high-powered blender until smooth. Taste and add additional agave to sweeten if required. Pour into serving glasses and sprinkle with additional ground cinnamon or cacao nibs. Enjoy on a verandah overlooking the sea. Did you happen to notice my new indoor plant? I took a picture of it outside on our timber deck for these smoothie photos, however it is now sitting proudly on my small coffee table in the downstairs lounge room. I was so sick of being indoors with the recent rainy weather and seasonably cooler temperatures and was craving a little bit of nature inside my home. Although I may be cooped up for long hours of study in our small, warm seaside cottage, I now have a beautiful green Peperomia plant to brighten my day. I can feel the subtle, positive energy that comes from growing living plants inside my home and it cost less than ten dollars. Ha ha! Thank you! If I could offer advice about this smoothie: The cinnamon gives it a beautiful flavour and should not be omitted. Thank you for sharing this. I'm craving a chocolate smoothie but tired of my same old routine. Thanks girl!!!! Look delish! My pleasure. In my recipe I used whole cacao beans, but nibs and powder work just as well. Cacao powder is best if you prefer a smoother drink. Yum!